Very comprehensive and include tiny stencil data items for each different type as well as commemorative insignia appropriate to the Dauphin, Gazelle and Alouette airframes. A well produced item from Max Decals. If you have not heard of them before, Max Decals specialise in producing decals for aircraft operated by the Irish Air Corps. 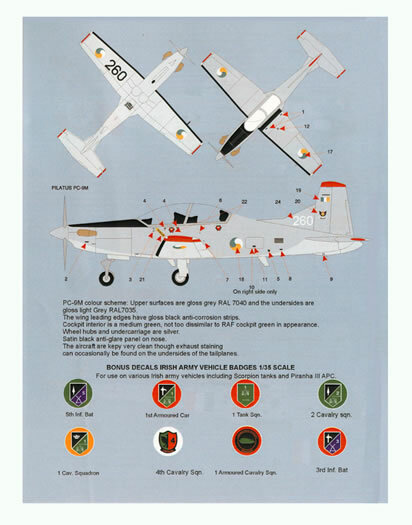 Their latest sheet, 4820 provides markings for aircraft of the Irish Air Corps that operated during the period 1990 to 2010. Siai Marchetti SF260W Warrior. Markings are provided for five different machines wearing overall glossy dark green with dayglo red tips to the vertical and horizontal stabilisers, spinner, nose and wing tip tank. Cessna FR172H. Markings are four different machines wearing the same overall glossy green scheme sans the dayglo red trim. Aerospatiale SA365Fi Dauphin. Markings for four different machines finished in an attractive scheme comprising an overall light grey with red and white trim. Each of the four options bears a different name and each name is supplied as a decal. Aerospatiale SA342 Gazelle. Markings for a single machine in an overall light grey with red trim paint scheme. Aerospatiale SA316 Alouette III. Markings for three machines in an overall light grey scheme. Pilatus PC-9M. Markings are provided to produce seven machines. 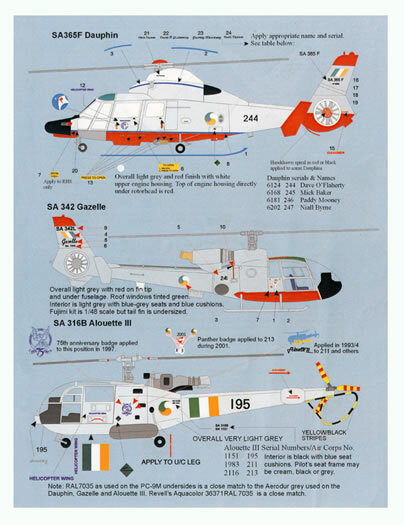 Missing is the numeral 5 which was assigned to the IAC PC-9M that crashed at Crumlin East on 9 October 2009. The machines are finished in gloss grey upper surfaces over light grey undersides. The tips to the vertical and horizontal stabilisers and wings are in gloss red. 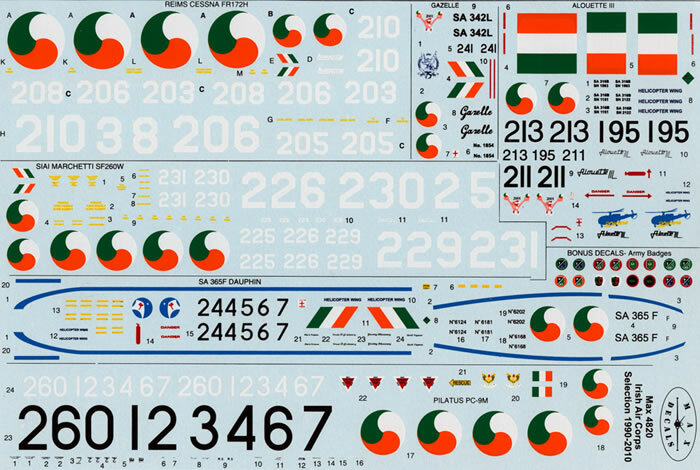 The provided decals are very comprehensive and include tiny stencil data items for each different type as well as commemorative insignia appropriate to the Dauphin, Gazelle and Alouette airframes. There is no advice as to what company produced the decals but they are thin, well printed and in perfect register. 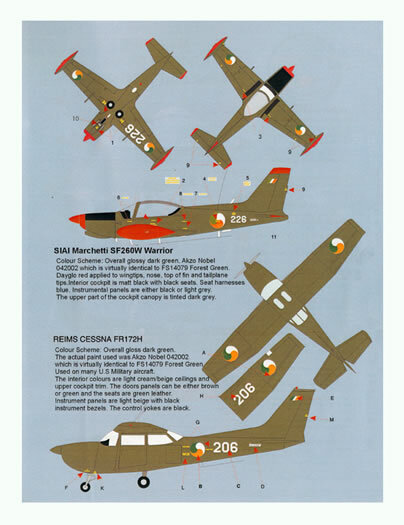 The white items appear to be opaque enough to survive application over the dark green of the Warrior and Cessna options and the white of the national insignia appears to have been printed over a white background to ensure that there is no bleed through of the underlying colour. The decal sheet and the placement guide come packed in a clear plastic zip-loc bag. This is a well produced item from Max Decals. 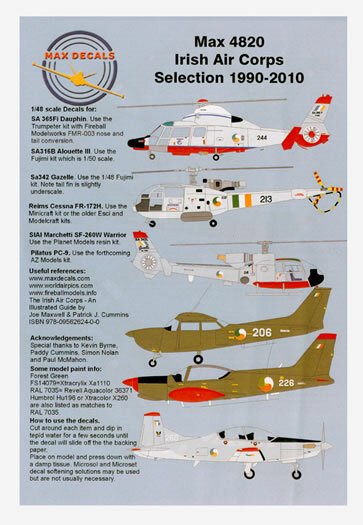 It provides you with a variety of decals to 1/48 scale (and 1/35th in the case of the shields) that enables you to model a selection of Irish Air Corps machines.